One of the biggest additions to iMindMap 9 is the brand new Fast Capture View, designed to keep distractions at a minimum, as to not interrupt your thought process so you can capture ideas quickly. Our reviewers were impressed with its speed and ability to help the user focus on tasks. 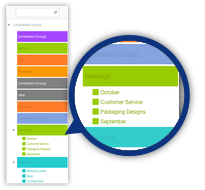 The Outline Panel boasts a faster and easier way to locate, edit, group and move ideas. Available in Fast Capture, Brainstorm and Mind Map View, the Outline Panel is geared to support your thinking, something our reviewers agree with. If you want to have your say on iMindMap 9 too, you can leave a comment on the iMindMap Feedback Forum. Our developers closely monitor the forum and love to hear your thoughts and suggestions.